Alvin, Simon and Theodore—along with their female counterparts, The Chipettes—head off on an oceanic cruise with their exasperated manager, Dave Seville (Jason Lee, My Name is Earl). On the cruise, Alvin acts like the annoying rodent he is by creating absolute havoc. The ship's captain warns Dave if The Chipmunks screw up one more time, they'll all get booted off the luxury liner. Compounding matters is the discovery that Ian (David Cross, Arrested Development), a slimy ex-music exec from the previous films, is also on the cruise working as a pelican mascot with a grudge against Dave. When Alvin and the rest of the chipmunks accidentally sail off the ship on a runaway kite, Dave and Ian give chase only to find themselves stranded in the middle of the ocean. Alvin and company end up on one side of a remote island, while Dave and Ian land on the other side. Will Dave locate his precious singing group? Can The Chipmunks survive such harsh, tropical conditions? Did we really need a third installment from this franchise? In a year that saw the release of Adam Sandler's Razzie award breaking Jack & Jill, it seems hard to believe there's a movie which can top that cinematic event. Yet here we are with Alvin and the Chipmunks: Chipwrecked. The first Alvin and the Chipmunks was universally panned (26% on Rotten Tomatoes), while the second film garnered even worse reviews (a measly 21%). The third installment managed to amass an even lower score: 13%. If they release a fourth movie, Rotten Tomatoes will more than likely need to start incorporating negative numbers. Alvin and the Chipmunks: Chipwrecked isn't terrible in the traditional sense; the production values are rather high and the film is competently constructed and polished. Where it stumbles is in the execution of story and character. The movie bounces from one sequence to another (usually accompanied by annoying musical interludes) without any real sense of purpose. The Chipmunks are shipwrecked on an island only so we can watch them build fires and make friends with the locals. Then they have to be rescued. This adventure has no reason for being. It feels as if the script was two pages long with a lot of spots that read "insert montage here." Who wouldn't want to find out what drew actors like Justin Long (He's Just Not That Into You), Christina Applegate (Anchorman: The Legend of Ron Burgundy), Amy Poehler (Parks and Recreation), and Anna Faris (What's Your Number?) to this project? What's the point of having big named stars in a movie if…a) they're not going to show their faces, and b) they're going to tweak their voices in a way that makes them 100% unidentifiable to anyone other than the editors? Jason Lee looks absolutely mortified to be here. Lee is a funny, likable actor who clearly wanted to buy another house in the mountains; why else would he take on a role that has all the charisma of a Jersey Shore guido? Jenny Slate is a stranded islander (ala Tom Hanks in Cast Away) who spends her time dancing in front of a green screen and talking to sports equipment painted with faces. The good news is her acting career has nowhere to go but up. The computer effects that bring Alvin, Simon, and Theodore to life are serviceable, but never remotely convincing or fun to watch. Clearly this was a rush job for whatever VFX house worked on the film, and little else. And then there are the musical numbers. Here's the thing about the musical interludes: it's bad enough to hear Beyonce songs sung poorly. It's a whole other beast to hear them sung poorly in screechy, high pitched chipmunk voices. Like nails on a chalkboard, the songs in Alvin and the Chipmunks: Chipwrecked grate the nerves within thirty seconds, less actually if you have any taste in music at all. Little kids will surely enjoy the novelty of The Chipmunk's vocals, but adults will know better. Finally, David Cross shows up as a character named Ian who we assume passed on representing The Chipmunks, The Chipettes, and Justin Bieber…twice! You know he had no desire for this film because Cross has gone on record to say that Alvin and the Chipmunks: Chipwrecked was "the most unpleasant experience of my professional life." We can understand why. This film is a void that cannot be filled. Presented in Blu-ray high definition widescreen, at least viewers get a bright attractive experience, with an image that's sparkling clean and colorful. The audio equally has enough punch to send those shrill vocals directly into your brain for all time, bypassing your ears altogether. 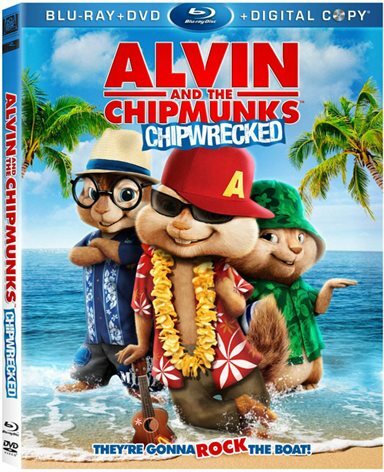 Pondering a question that has been plaguing movie fans since the advent of digital media: Why is it so many classic movies are given bare bones releases, while a film such as this like Alvin and the Chipmunks: Chipwrecked are packed with bonus features? Viewers can troll through a boatload of extras including: some extended scenes, a batch of behind-the-scenes featurettes ("Fox Movie Channel Presents: In Character with Jason Lee," "Going Overboard," "Munking Movies in Paradise," "Everybody Munk Now," "Alan Tudyk, Chipmunk Apprentice"), a featurette with the son of Alvin and the Chipmunks creator Ross Bagdasarian ("Growing Up Alvin"), a "Munk Music & Dance Machine" game for kids to play, three music videos, some promotional material, BD-Live content, a standard definition DVD copy, and a digital copy for your portable devices. Alvin and the Chipmunks: Chipwrecked doesn't have an ounce of originality, wit, or enjoyment in its nearly hour and a half run time. This is an empty experience that will have the youngest kids entertained and the rest of the viewing audience lost at sea. Download Alvin and the Chipmunks: Chipwrecked from the iTunes Store in Digial HD. For more information about Alvin and the Chipmunks: Chipwrecked visit the FlickDirect Movie Database.